Single blokes have it simple, you like simple things with two syllables like football. And you get to watch match of the day if you want. Married men – we like simple things – words with two syllables, like bake off. We watch it not because we have to, but because we want to and we’d actually quite like to bake a cake, even if it turned out well – in which case our wives would hate us for it. Family life is more complicated. Having 3 daughters, for example, I was a bit miffed when someone thought I might have a favourite. Sarah-Louise, Ruby-May and Devil-Spawn believe me, they are all treated the same. This guy asked me “If they were all drowning which one would you save?” That’s a ridiculous question – isn’t it? I can’t swim! I love my kids. And I love my wife. I heard her start to use the hairdryer while she was in the bath and I thought: No! she’s actually using the hairdryer in the bath – you’ve got to do something! So I rushed in and shouted “drop that hairdryer”. Later, in counselling, this woman said to me “You’re interpreting everything your wife does negatively; try to see the positives in everything she says and everything she does.” I thought “OK Fair enough”. I’ll try it. So we were in the kitchen larking around and I said “oh come here coochy coochy coo – give me a cuddle baby”, and she pushes me away and said “you’re not funny get off”. And I thought “aww bless her” – “she’s just helping to toughen me up ready to face the hecklers”. Set your thoughts free. Apparently we can only hold 4 things in our heads at once. Writing things down in a list that I need to do, or ideas, or anything just helps me live in the present. I know I might never have that thought or idea again, and no matter how lame it might be – I’m going to capture it – so I can have new ones – hopefully even better ones. Make you more successful. At the moment, I’ll confess my lists are task oriented rather than goal oriented but all that is about to change. A friend (thanks Pete) introduced me to a book which is ideal for keeping and monitoring your goals. So in addition to my lists of daily tasks, I’m going to have a list of goals as well. I just can’t wait (and no I’m not kidding). Save you Money. For me, I will use a shopping list when I go shopping – but not all the time. And when I do, I tend to stick to it. Browsing the supermarket instead, usually means that I come out with junk that I just don’t need. There’s something satisfying about creating something in your imagination first and then putting it into reality – even something as simple as a shopping list can do this. Beat self-doubt and bolster your self-esteem. This is an idea to list your achievements. I haven’t really tried this suggestion, but it still rings true. At the end of the day I can see the things I planned to do and which ones are completed. But I could benefit from listing what I achieved in a day – as quite often these things are not what I planned. Ensure you don’t make mistakes. I love this one, because it points directly to the work of Atul Gawande and his amazing contribution with his book The Checklist Manifesto and the introduction of checklists into medicine to save lives. It’s really important to follow standard processes to ensure quality – and to improve these processes and checklists helps us do that. Yes, it’s a specialist list alright. Help you to stay focused. As soon as something is written down, I tend to stop worrying about it. 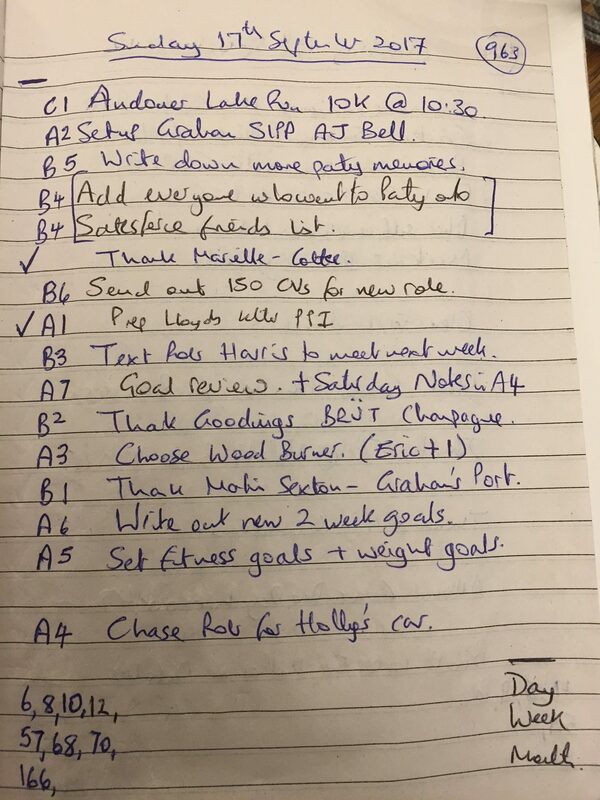 I prioritise my lists and review them – and that way the important things do tend to get done and the rest of the noise just goes away. Yes, all that helps me focus. Face up to things you’ve been putting off. Yes, once things are on the list and they’re prioritised – the trick is to do the important ones – even if they’re daunting. Or a least start them. A lot of the time the items on the list will need to be broken down into smaller more granular items in order that the big ticket item can be ticked off one day. So this article tends to talk about the benefits of writing lists. I imagine that there are a lot of people who don’t keep them, or only use them occasionally. I’d be very keen to hear from people who don’t keep them and why not. I’d be lost without my lists and I’m sure I wouldn’t function as well without them. But then again, I am a self-confessed list maniac. Please post and let me know your experience of lists.